Bananas are a good source of carbohydrates. Glycemic index (GI) is the ranking of carbohydrates on a scale of 0 to 100 according to the extent to which they raise blood sugar levels after eating. The glycemic index of banana ranges from low to moderate, that is from 51 to 56. This means banana raises blood sugar in moderation. However, the glycemic load (GL) is a better measure of the type of carbohydrates as compared to glycemic index. As it takes into account both the quality and quantity of carbohydrates. The glycemic load is the measure of increase in blood sugar levels after eating one serving of that particular food. The glycemic load of banana comes upto 6.5 which means it is a low GL food. Is banana suitable for diabetics? 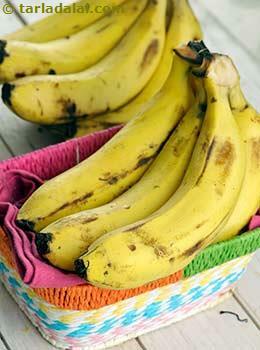 As banana has a medium Glycemic index and low Glycemic load, it is not a dreadful fruit for diabetics. But to be on the safer side, diabetics can eat only 1 serving of banana (1 small banana) at a time. Or else, they can combine it with various low glycemic Index foods like low fat curd or Low fat milk or a handful of nuts to reduce the overall GI. For example, instead of having banana alone, a diabetic can make a Banana oats smoothie out of it (without adding sugar or honey), by combining banana with oats and low fat curds which will reduce the glycemic index of the recipe, making it a preferred option also for weight watchers. However, a diabetic should make sure that he eats no other source of carbohydrates with banana. And also banana should be only an occasional fruit. But again, recommendation of banana for diabetics completely depends on the individual’s insulin levels and the doctor’s advice.